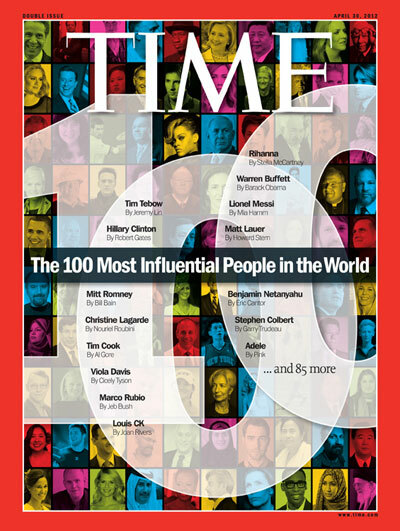 The Time "100 Influential People in the World" issue published April 30th was of course populated with a veritable who's who list of movers, shakers and otherwise incredibly important people in the world. - Sara Blakely: founder of Spanx - According to an earlier vignette in this issue, the world's youngest self-made female billionaire at 41 ... if that's not interesting, I don't know what is. - Christian Marclay: artist behind the 24-hour long clip film "The Clock" - Sounds to be a fascinating movie and both it and Marclay are featured in "The Hours" by Daniel Zalewski for The New Yorker. - Salman Khan: founder of Khan Academy - Remarkable story of free education tutorial videos from a guy whose work featured in both a Businessweek profile and Fast Company Most Creative People in Business list. - E.L. James: writer of the 50 Shades of Grey trilogy books - An author having the top four spots, including a 50 Shades box set, on the current New York Times Fiction Bestseller List is nothing if not interesting. - Louie C.K. : comedian - Known for doing things completely his own way both creatively and in business with his television show Louie and self-produced and sold online comedy specials. - Ben Rattray: founder of change.org - The site which helps enable social change became much more well-known earlier this year with its petition asking for prosecution of George Zimmerman for shooting Trayvon Martin. - Ann Patchett: author / bookstore owner - It I'm sure helps her cause to be a best-selling author, but was a cool story of Patchett seeing her hometown of Nashville, TN being without an independent bookseller and as a result, opening Parnassus Books. - Barbara Van Dahlen: Runs the nonprofit organization Give An Hour devoted to assisting with the mental health of veterans and their families. 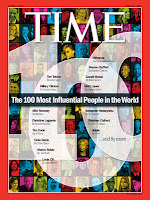 Seems a great mission and reminds me of the Joe Klein cover story "The New Greatest Generation" for Time. - Hans Rosling: Became known for a 2006 TED talk on worldwide socio-economic development told through statistical models... now with 4 millions views on the TED site. - Walter Isaacson: Biographer who wrote both the bestselling Steve Jobs (which I reviewed here) and similarly acclaimed works on Benjamin Franklin and Albert Einstein. - Erik Martin: 33 year old general manager of the site Reddit, which I first heard about a Jason Fagone piece for Wired written about in this blog post. - Cecile Richards: The leader of Planned Parenthood and responsible for providing health care and advocating rights for many women in need nationwide. - Virginia Rometty: IBM CEO who has helped the company to its current position of financial strength and (as the Time piece on her states) she's someone known for pushing the company in the area of corporate responsibility. - Hillary Clinton: Someone who has obviously lived many lifetimes in terms of her influence and has by almost all accounts done an exemplary job as U.S. Secretary of State.